Happy July, friends! This will be a month of celebrations and birthdays (including my own!) so I've been trying to think up new ideas for party food. One of my favorite desserts of all time is creme brulee, and with all the juicy ripe strawberries at the market right now I felt the two should get together. 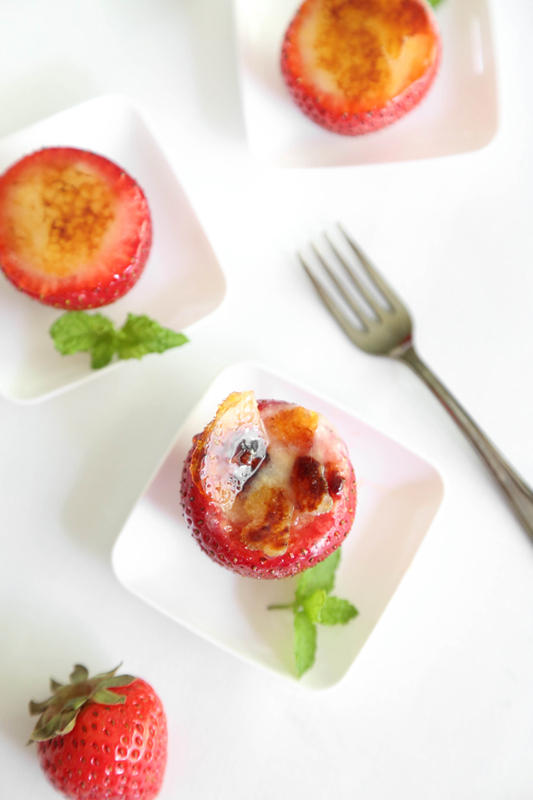 The hollowed-out berries each hold one spoonful of creme brulee. 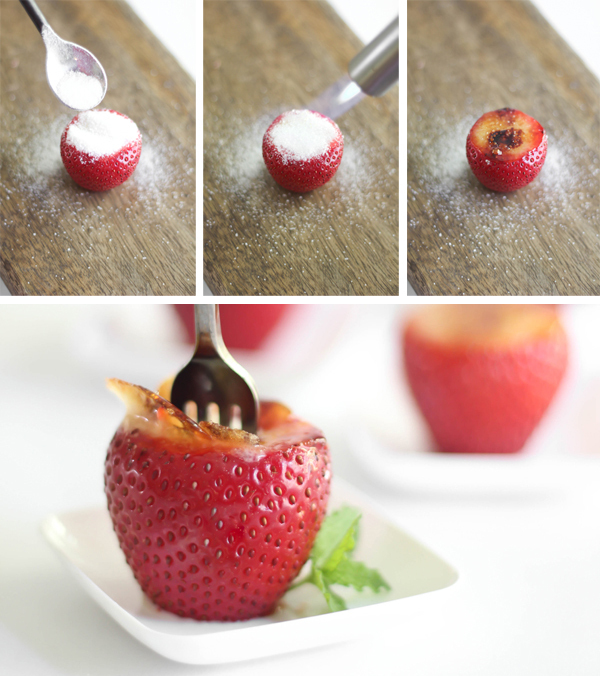 The tops of the strawberries are heaped with granulated sugar and then torched until caramelized. It's all so nice together - the freshness of the berry, the creamy custard and the crack of the caramelized sugar - it's a perfect bite! To make the berries stand upright, cut the pointed end off flat with a serrated knife. Hollow the centers and take extra care to avoid piercing through the sides. At this point the berries can be filled with creme brulee and stored in the refrigerator until you're ready to serve them. Just before serving, place a spoonful of sugar on top of each berry and use a chef's torch to caramelize the sugar. You can also caramelize the sugar under the oven broiler, just be sure to get it good and hot before you put the strawberries in. The strawberries will break down under heat, so they should only be allowed to stay in the oven for 2-4 minutes, just long enough for the tops to caramelize. Keep a sharp eye on them, it won't take long! These turned out better than I'd hoped! I served them with mini forks but honestly there's no need for utensils. If you serve them to guests, I suggest putting the berries in paper liners for easy pick up, or have napkins close by to keep fingers tidy. Heat the cream, half and half, and vanilla bean (or vanilla extract) in a medium saucepan over medium heat just to a boil. Immediately turn off the heat. Set aside to infuse for 10 minutes. Whisk the egg yolks with the sugar in a large bowl until just combined. Whisking constantly, gradually pour in the hot cream mixture. Pour the mixture into a 10x10-inch baking and remove the vanilla bean. Place the 10x10-inch pan in a large roasting pan and pour in hot water until it reaches halfway up the custard pan. Bake in the center of the oven until the custard is set but still has a slight wobble (it will cook more as it cools), about 55-65 minutes. Remove it from the water bath and let it cool. Cover with plastic wrap and place in the refrigerator until chilled, about 2 hours. 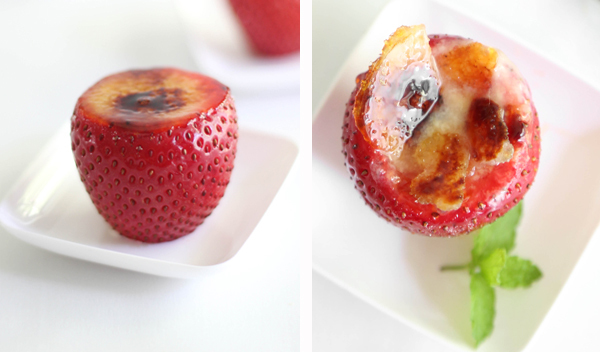 Fill each berry with a spoonful of creme brulee. Store the filled berries in the refrigerator until you're ready to serve them. Just before serving, place a spoonful of sugar on top of each berry and use a chef's torch to caramelize the sugar. You can also caramelize the sugar under the oven broiler, just be sure to get it good and hot before you put the strawberries in. The strawberries will break down under heat, so they should only be allowed to stay in the oven for 2-4 minutes, just long enough for the tops to caramelize. Keep a sharp eye on them, it won't take long! Let the berries stand for 5 minutes to let the caramelized sugar harden. Note: The longer the berries stand at room temperature, the more likely they are to weep a little berry juice around the bottoms. I suggest serving these in paper liners or cute candy cups. They'll keep things tidy and disguise drips of berry juice. Oh my, now usually I get all uppity about strawberries having anything done to them because I adore them so much, but these are so fun and delicious sounding that I think I could let that slip for once and eat a plate full! These are soo cute. Love this idea! 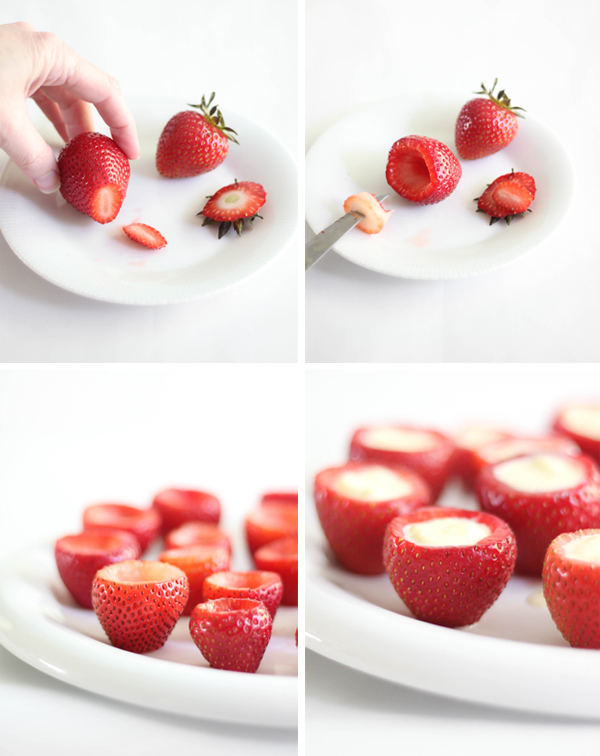 These strawberries not only look awesome, this is such a creative idea! Any girl who loves dessert will be super impressed! amazing!! That is a magical feat! Perfect for a little girls party - this is fairy food! Oh. My. God. I fell in love with your idea. Can't wait to try it, really! Oh, these are so unique!!! These sound so tasty and look incredible! Love the recipe! I will most certainly make these before summer's end - LOVE! I am so smitten with this idea! Sweet, little bebe creme brulees! That is such a wonderful idea! These strawberries must taste heavenly. This is so amazing! What an awesome idea...and tasty I'm sure!! I've never had creme brulee! Still, these sound delicious! I wonder how they would taste with the strawberries dipped in chocolate too?? What a fantastic and cute idea! This just caught my eye. I am a big fan of cream brulee and this picture is so catchy. I will have to try this and impress my friends. This is amazing and so sophisticated - love it! Great! 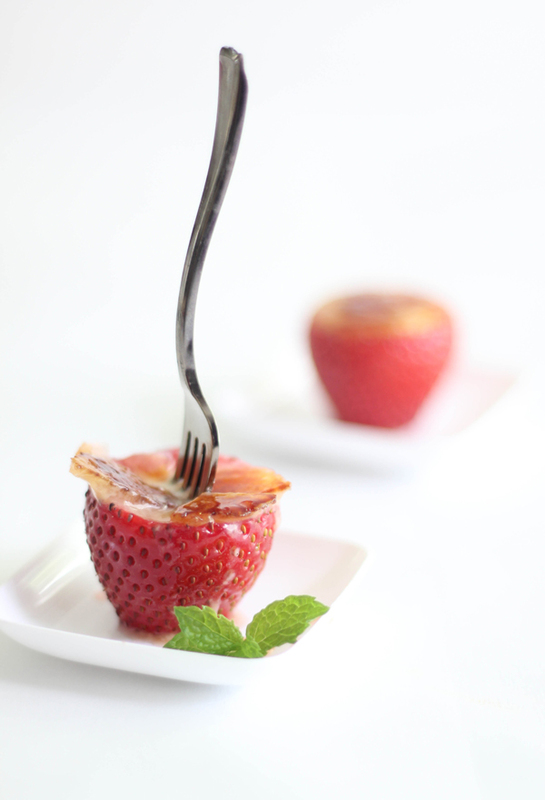 Thanks for sharing the recipes of Creme Brulee filled with Strawberries. I tried it yesterday together with my friends and they really loved it. This is timely since I'm going to organize another wedding event and I will definitely include this in my dessert list. P. S. Advance Happy Birthday! I'm thinking of making these for a baby shower. Could I refrigerate them after having them in the oven? Thank you. This is amazingly useful.. Thanks for this share.. !!! These are a dream come true! your killing me with the great ideas here! so glad i stumbled across your blog - this is definitely a recipe i will be trying. i'll be back.. thanks for sharing! How perfect are these! What a classy but still fun sweet treat. Loving them. wow that looks so good! 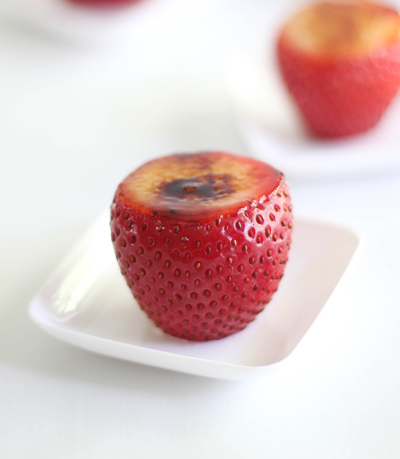 I love brûléed fruit - brûléeing grapefruit is awesome too! I love these bite sized treats! Yum! Hello Heather! Happy belated birthday! 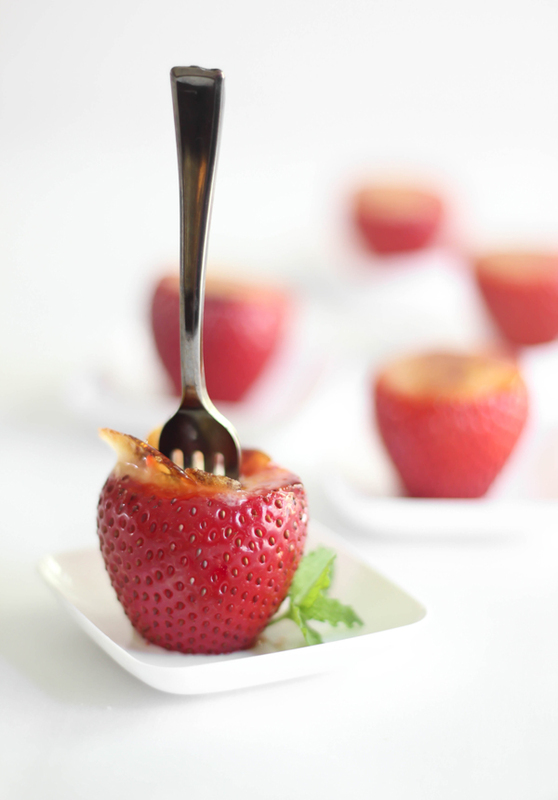 If you had these gorgeous, creme brulee filled strawberries, then I'm certain you had a lovely birthday celebration! I love these for party food. . so inventive!!! Also, wanted to say congrats on the shop! I love the Macaron Coin Purse!!! so cute! congrats, you are an inspiration! These look ridiculously beautiful! I can't wait to give them a try ! Charming photos! Would definitely consider giving this recipe a try - this can come harmoniously great with the dessert sets in our packages! Thank you for this one.